For the past few weeks I’ve been immersed in communication strategy, theory and design. Often I’m brought into conversations around communication because I’m a vocal advocate for the use of social media and networking tools. One of the challenges of using social tools like Twitter, Facebook, blogs, YouTube, etc is that it becomes easy to forget that it’s not the tool, it’s the what it builds that matters. It’s also easy to get lost in the theory’s, design’s and strategy’s that abound. To navigate the complexity that surrounds building a communication strategy in this age of online, open and connected communication media I find it clarifying to go back to the basics, to find simpler models to serve as a foundation. The non-linear design model is one such model. It’s an adaption based on Ross Laird’s Non-linear Curriculum Design Model which he in turn adapted from the Bodynamic Group Process Model. The adaptability is a function of the model’s grounding in what we know to be true about relationship building. Communication is the primary route to relationship building. Communication in many ways is a technology, it’s a tool that can be used to create, nurture and be in relationships. 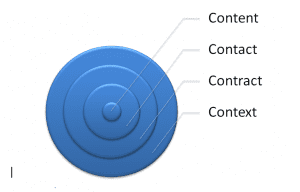 Context is the foundation and the retaining ring of the whole works: it determines the contract and everything after. Context includes many subtle and not so subtle factors including; age, culture (including cultures that influence deeper culture like organizational culture), gender, lifestyle, economic background, health, politics, sexuality, education, life experiences, values, norms, ethos, social contracts, etc. If working in multiple contexts then each group may need a connected but unique Contract and plan for Contact and Content. Contract is defined by the context. What do constituents/customers/clients/community members need and what do you need? This needs to be articulated clearly and concisely. Contact is defined by the Contract. Good contact is essential and is the one thing you cannot control. Model what you want to see. Understand your own and your organization’s process. Content is the last thing to consider. This is what you and your constituents/customers/clients/community member do to communicate. It includes the messaging, methods, frequency and media used. This is that last consideration. Related to this and in line with this model is a body of work around Participatory Communication Design. Their handbook is amazing and resonates with the ideas and ethos that are driving open source innovation and “social networking for a cause” efforts. Thanks. Looks like a really interesting conference. Sorry for the short notice. I would love to see you as a presentor. Addictions and unemployment as a topic – or more importantly, how to use motivational interviewing in a group setting.